If you search the pantry of just about any household, you will likely find that vinegar has made a home on one of the shelves. What’s special about vinegar is that is so diverse and can be used in a variety of tasks from clearing the skin to disinfecting food. As a surprise to many, vinegar is also an effective window cleaner and often puts most commercial brands to shame. 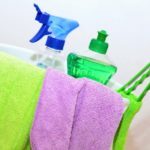 The benefits of cleaning with vinegar are plentiful. But just to narrow things down to the specific topic, here are the pros that come with washing windows with vinegar. 1. It is both cheap and easily accessible. Vinegar can be found on the shelves of virtually any store that sells food or cleaning supplies, and it can be purchased for under a dollar up to a few bucks (depending on the size of the bottle). 2. It is a non-toxic cleaning agent. Unlike many commercial window cleaners, vinegar poses no health threats and is free of harmful chemicals. This makes it safe to be used around small children and pets. 3. It is versatile. Vinegar can be used in many jobs and is effective on any type of glass. 4. It is a streak-less cleaner. Uniquely, vinegar has a way of providing a streak-free appearance to just about any surface that it makes contact with. Though there aren’t many, as with all things, there is always a con or two (sometimes more). Here are the few downsides of using vinegar to clean your windows. 1. Vinegar has a harsh aroma. It is hard not to recognize the bitter smell of vinegar, and most people do not care to have this smell in their homes. Luckily, the smell will quickly dissipate in certain instances and essential oils can be used to aid in other circumstances. 2. Vinegar may dull certain surfaces. Though your windows aren’t necessarily in harm’s way with this con, the surrounding areas may be. Because of its acidic nature, vinegar has a tendency to dull shiny surfaces. It’s best to keep vinegar away from surfaces covered with granite, marble, onyx, or anything else that glistens. 3. It isn’t the best anti-grease agent. If your windows for some reason have come into contact with grease, vinegar may have trouble cutting through it. Can Vinegar Be Used To Clean Any Type Of Glass? Yes, vinegar is a viable cleaning agent that will work wonders on any type of glass. 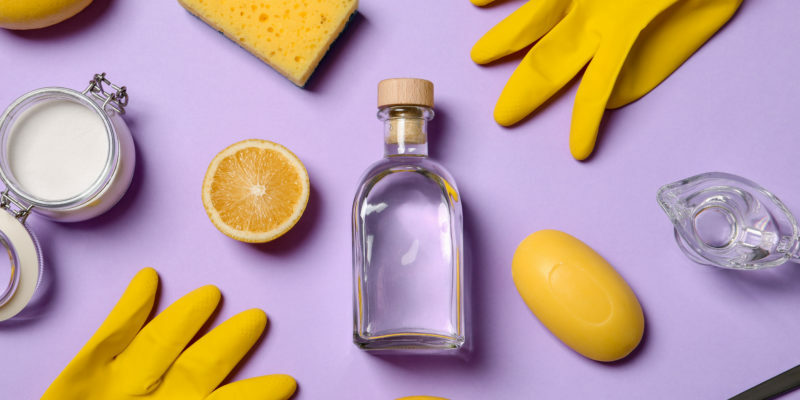 Whether you are removing toothpaste from your bathroom mirror or cleaning gunk off of your windshield, vinegar is the short answer to your problems. However, there are different methods to go about the cleaning process depending on the surface that you are trying to polish. Is Vinegar Alone Effective Enough? Depending on the job at hand, vinegar can be the sole ingredient needed to polish your windows and leave a streak-free finish. These situations are those that present glass surfaces that have already been cleaned and are free of gunk, grease, dust, or any other impurities. In other cases, it is best to couple vinegar with another agent. The dynamic duo, baking soda and vinegar is used to take on the toughest, most grimy jobs. This potent formula is a good one to use for windows that aren’t in the best of conditions and may need a more intense clean. The baking soda can also be swapped out for ammonia for an equivalent effect. For a more gentle wash, a concoction of vinegar, water, and a couple of drops of dishwashing detergent will do the trick. Will Vinegar Damage My Vehicle? It is no secret that conventional auto window cleaners are often counter-effective and will more likely than not send you to a carwash to get them professionally cleaned. When it comes to polishing your windows with vinegar, keep in mind two key factors. One, you will need to use microfiber towels (or shammy towels) as regular ones don’t work as well and two, though vinegar is generally safe to be used on most platforms, its acidic content may cause damage to other areas of the car. To protect the other facets of your vehicle, cover the surrounding areas with towels or thick blankets and be careful about only applying the vinegar and water solution to the window. What Effect Will Vinegar Have Against Ocean Water? If you are a boat owner or live near the ocean, you are probably aware of the damage that can be caused to exposed windows. As the ocean water makes contact with the windows, there is only a matter of time before the salt begins to build up and eventually causes corrosion. Inevitably, if not corrected in time, the windows begin to weaken and will need to be replaced. Before this happens, try window cleaning with vinegar and add both ammonia and a salt-resistant agent for a more powerful clean. The vinegar will pose no negative effects and can be used as often as needed. Window cleaning with vinegar is quite simple and safe no matter what factors are involved. With vinegar as the primary agent, other ingredients mentioned can be used to create a more powerful formula or provide a more gentle effect. In most cases, vinegar can be used alone to get the job done. Some people may choose to add an essential oil of choice to cope with the pungent odor. Here are a few tips and specifics to keep in mind when it comes to cleaning windows with vinegar. When you are doing a light job, you can use equal parts of water and vinegar. Apple cider vinegar is also a great alternative. It has the same capability, yet is less acidic, therefore, provides a more gentle clean. Unless you are cleaning windows with vinegar in conjunction with ammonia or baking soda, clear the surface of dirt and dust beforehand. If you neglect to do this, you will only be pushing the impurities around instead of giving the window a proper clean. The ammonia and/or baking soda will effectively remove the waste. Always cover sensitive surrounding areas when working with vinegar. It will not alter appearances as quickly and aggressively as bleach, but it may eventually wear down on certain surfaces. Aside from this, vinegar can be used for the long haul and will not present any negative long-term effects. Always use shammy towels when cleaning automobile windows or those of a thicker quality. Paper towels will work in other cases. Vinegar is a miracle worker and a powerhouse in terms of cleaning but is even more profound when it comes to polishing windows. With this household favorite, you can say goodbye to overpriced commercial products for good.